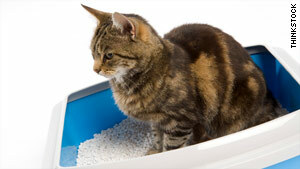 It can be tricky to tell the in-laws that their messy cat is no longer welcome in your home. (RealSimple.com) -- A Modern Manners columnist answers a reader question. Question: My in-laws visit frequently, and while we enjoy their company and the great relationship they have with our two children, they insist on bringing their cat each time they visit (we have one small dog). The cat creates quite a mess in our guest room, including several urine stains that my husband and I have failed to resolve without a professional cleaning service. What is the best way to tell them that their cat is no longer welcome without putting a strain on the relationship? Answer: Anytime something has become a habit, it's harder to speak up about making a change. So I can understand your dreading asking your in-laws to please leave Miss Pees-A-Lot at home. Assuming your husband shares your desire to be cat-free (and if he doesn't, that's a whole other problem), the first thing I would recommend is that he make the request, not you. No, I'm not copping out or giving you a free pass; it's my firm belief that whenever possible, we should all deal directly with our own parents, siblings, children, and so on. I realize there are going to be exceptions to this rule, such as when someone has a personal issue with an in-law that doesn't concern the blood relation (and in those cases I strongly urge direct communication), but that's not the case here. So I would advise your husband to start the conversation as you started your query to me -- with all the positive stuff. Have him emphasize how much you love their visits and the great relationship they have with your children. Then have him say that you want to be able to continue enjoying these visits, but to do so, you're going to have to ask that they leave little Snuffly behind. Your husband can say he knows how much they love bringing Snuffly, and how much you all love Snuffly, but it has simply become too burdensome to have him in the house. If they get their backs up (sorry, couldn't resist) and point out that they've always brought him and how difficult it would be to leave him behind, you can explain that you waited this long only because you were hoping to find a way to make it work, but alas, it's simply not viable. Then change the subject to your grandchildren until you're safely off the phone.